OSI Builds Better Billboards | Outdoor Specialist, Inc.
Billboards Built Better That The Weather! Signature Torsion Connection Box By Outdoor Specialist, Inc. In fabricating the best structure possible OSI has re-engineered simple beam torsion connections to the next level. 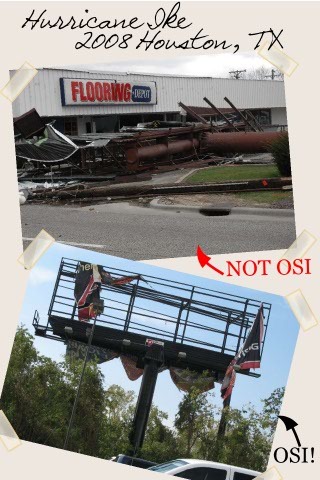 OSI’s “Signature Torsion Connection” is a key feature that provides real world benefits, outdoor advertising structures that have survived hurricanes when others fell over. Our “Signature Torsion Connection” exceeds industry standards and makes our billboard designs long term investments you and your clients can count on! The “Signature Torsion Connection” provides strength and integrity to one of the critical areas of every outdoor advertising structure we fabricate. OSI engineers billboards with the knowledge that most parts of this country experience weather that can challenge any structure. With that in mind OSI’s skilled engineers have designed the ribbed or gusseted torsion connection we know to be one of the strongest in the industry. This masterpiece of welding shows the time consuming detail on every OSI structure and complements the touted and very skilled certified welding staff we are so happy to have on our team.